When you visit a university in Shanghai you will usually find at least two types of shops nearby: Snack shops (lots of them) and stationery shops. I have not yet seen another city where this phenomenon is as obvious as in Shanghai. The stationery shops can be split into two groups: stationery shops with functional stationery and stationery shops that sell girly stationery as well as other things like make-up, charms, etc – but you can also find shops that are somewhere in-between these two groups. After my good experience with another Deli sharpener I could not resist and bought this TLR shaped sharpener, the Deli 0668, in December 2010 when I saw it in it in Shanghai – in a stationery shops outside a university. 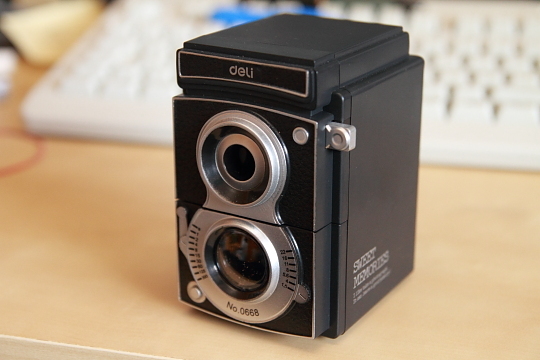 Deli’s headquarters are near Shanghai, so I it is not surprising that this sharpener was inspired by a Shanghainese-made Seagull TLR1. I paid about ¥ 30 (£ 2.80, € 3.30, $ 4.50) for this sharpener, a bit more than what I paid for the Deli 0635. You can get this sharpener cheaper if you look around or if you buy online, e.g. from Taobao. Outside China you can get this sharpener from Kikkerland for $15 (£ 9.30, € 10.80) or from Urban Outfitters for £ 15 ($ 24.20 , € 17.50)2. It is currently on offer and can be bought for £ 8 online and in the Urban Outfitter shops . 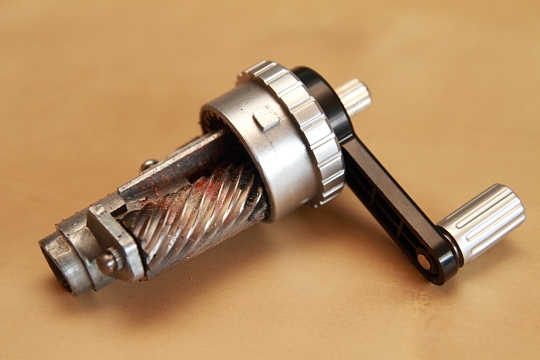 The 0668 has a single rotary blade cylinder, similar to the one in the 0635. There is also a removable tray for the shavings. 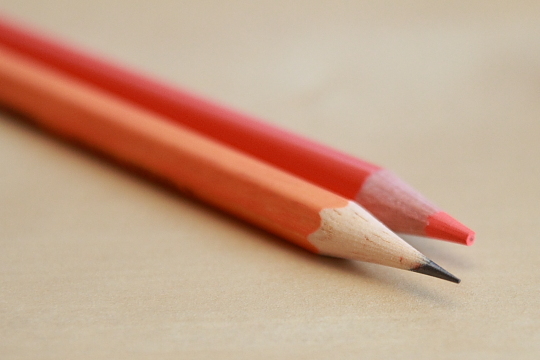 The clamps that hold the pencil during sharpening have a rubber surface so they won’t damage the pencil’s surface. Additionally, there is an automatic stop mechanism that will prevent you from over-sharpening a pencil. The main difference between the two Deli sharpeners is that the 0668 produces a shorter (and blunter) point. 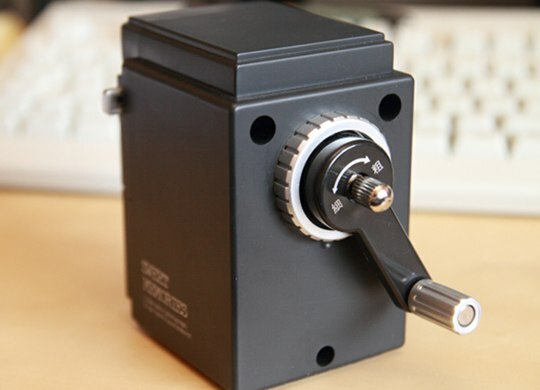 It also features a point adjuster switch similar to the one seen in the Carl Bungu Ryodo BR-05 pencil sharpener, reviewed at pencil talk and in the Dahle 133 / M+R 0981, reviewed at Lexikaliker. The blunt setting at the extreme end will result in a “point” diameter of about 2mm is only suitable for colour pencils with a wide core. Normal graphite pencils do not have a wide enough core for this setting. Conclusion: A great sharpener for a great price. I will not use the blunt setting and, to be honest, I do prefer the longer point I get from the Deli 0635 much more. It is nevertheless a sharpener I will enjoy using. It is currently in my office where I use it for all kinds of wooden pencils, but not for pencils that use difficult to sharpen material, like the Wopex, as my experience with the Deli 0635 has shown that the Deli’s automatic stop mechanism does not work with these pencils and that the harder material seems to be detrimental to the blade cylinder. A Faber-Castell 1117 sharpened using the sharp setting and a Uni Mitsubishi Arterase Color Vermilion sharpened using the blunt setting. 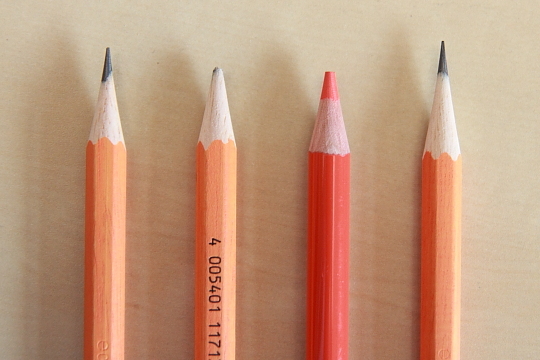 The pencils used in this blog post are Faber-Castell’s 1117 B and Uni Mitsubishi’s Arterase Color Vermilion 310. The 1117 feels like an unpainted pencil. It is not really painted but features a water-based varnish. It also has a breakage-resistant lead and an eraser. It does performs well for a budget pencil. It is made in Germany and sells for around € 0.30 each (~42¢, ~25p). You can find a review of the Faber-Castell 1117 at pencil talk. The Uni Mitsubishi’s Arterase Color Vermilion 310 is made in Japan. I do not have more information about this pencil, but you can find a review at Lexikaliker and at pencil talk. I would like to thank Lexikaliker for the Arterase Color pencil used in this blog post. I prefer the Deli 0635 long point as well, at least from the photos. Thanks! Memm, while in Shanghai were you able to load up on some Carl products? Wonderful daylight photos! They have me wishing for spring to arrive. Even today, there was a new snowfall here. Your review is excellent. The Kikkerland version of this sharpener is available in Canada – I think it is a very clever construct, and hope it promotes pencil use. Gunther, the sharpener is really great, but in every aspect, except the adjuster switch, it is a bit worse than the fantastic 0635 – and even though I like cameras and find the look of the 0668 good I have to say that the look is on the kitsch side. Stationery Traffic, reduced from fifteen to twelve to eight quid. 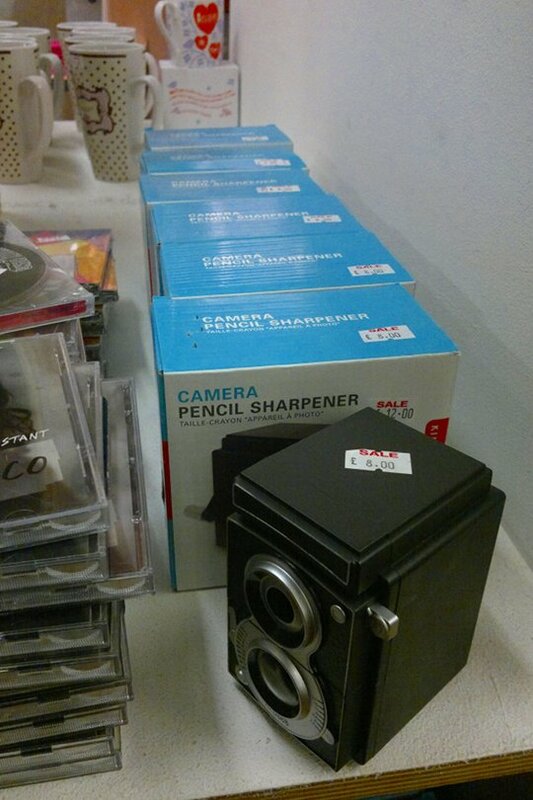 The sharpener is certainly worth 8 quid, it’s great, but I am not happy with their profit margins. I bought it in a shop, too – not wholesale and it was a fraction of the their price. Sean, I did not see any Carl products. They don’t seem to be very popular in Shanghai. In the last years you can find more and more Chinese products. Carrefour, a French supermarket, had a great selection of extremely cheap Faber-Castell products, but I haven’t been to Carrefour in recent years, only to E-Mart, a Korean supermarket. When it comes to branded pencils I was also surprised to see that you find more German brands than Japanese brands. The roles are reversed when it comes to gel pens, which are much more popular. Pencils don’t really have a hip imagine in Shanghai, unlike gel pens – but this is similar in Europe. Stephen, one of the things I miss most in Winter is that usually there is no snow here in this part of the UK 🙁 I really miss snow, but I can understand that there is a point when you are fed up with it. The photos are actually not 100% daylight photos, it was quite overcast and our windows are quite small. I used a fill flash, bounced off the ceiling. Urban Outfitters get the sharpeners from or through Kikkerland (I assume from or through their Dutch branch, not from the USA): their sharpeners have Kikkerland printed on the back and don’t have “Sweet Memories” printed on the side. I hope this sharpener promotes pencil use …and I hope people who buy this sharpener don’t try it with a poor, scratchy “free gift” pencil, but with a proper pencil – not that they lose their new-found interest again. 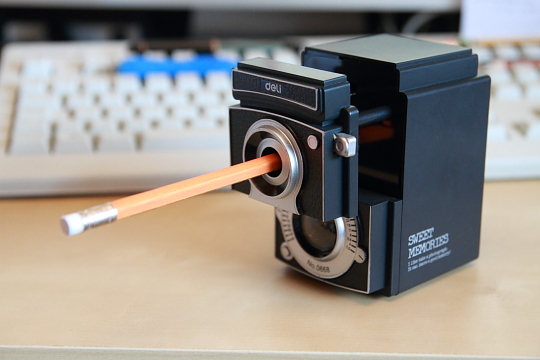 I really love the design of the sharpener and happy to read that it is works great! I have one of these old sharpeners too. I got it many years ago (must have been more than 25 years) when my dad brought it home from work I guessed at the time. Since then I have the A.W. Faber Castell N°52/25. And it still works! Amazing that these devices from the older days manage to survive while the new products only lasts a few seasons …. hen, it’s really great. I hope the design will not put some customers off, but then I guess they sell the same mechanism in a ‘serious’ look, too. Marcus, it’s actually not an old sharpener, at least not the one I got. Good to hear that yours is still working well. In the blog post I mentioned the Uni Mitsubishi Arterase Color Vermilion. Today I had a very strange experience when labelling a notebook with this pencil. The Vermillion started to scratch the surface of the notebook. When I examined the pencil I noticed that only one area of the lead was scratchy. I then started scratching that part of the lead until I got a tiny, hard fragment out. My assumption is that the fragment was in the lead all the time. The fact that I store my pencils point up makes it unlikely that the point picked the fragment up in my pencil holder. …and again sounding like a broken record, the best feature is the protected grippers. I have read countless (hundreds) sharpener reviews on amazon.com (both UK and US) and never found any review which objected to the awful bite marks regular rotary sharpeners leave on the pencil. No wonder manufacturers continue to design them with these awful metal teeth grippers when no one cares. Even when sharpeners do have protected grippers it is rarely if ever mentioned as a positive feature. Can anyone tell me if the Q-connect model 02291 has protected grippers or not?. I’ll continue on my crusade. Hi, thank you for the very interesting series of posts on sharpners. The Kohinoor (Czech) 9095000110PK looks identical to this deli except for the markings on it. I have the Kohinoor and it accepts 8-11mm dia pencils and has padded grips. abderrazak, la petite machine offre un excellent rapport qualité-prix.